The last day of the month was less than successful in raising revenue with all areas being considerably down on last week. The weather was foul and I suspect the Olympic effect hasn't helped. Nonetheless, there were some significant achievements today as Henry Ellison looks a complete loco again and the steam team deserve many congratulations for drawing this project to a conclusion with running in likely to be only a month away. Track patrols were out and about to good effect with the service trains providing return transport after their sections were checked. It was also a pleasure to welcome Alan Taylor to the cab of the 1020 to Duffield as he transported a splendid mile post 133 1/4 that had been discovered as missing from Duffield tunnel. It is now fixed in place and is a great credit to his ingenuity in replicating the original. Fred and Iris were most welcome today as they fully cleansed the Mess Hall which was left in a disgusting state from the weekend. It is a great shame that we rely on an elderly couple to clean up after "grown up" adults. End of rant. The LMSCA continued with fixing the end panels of the BTO and tended to leaks in their support coach which appeared to included the application of pink emulsion. I'm not sure whether Lord Stamp would have approved. The Pullman Buffet Car, 2 Booking Halls and EVRA shop did their best, against all odds, to Hoover up revenue from our visitors. However, Leigh and Robin are to be congratulated for making the Santa bookings live on the web site - yes it will soon be Christmas. It is with some sadness I have to report the departure of another one of the original group of eight that commenced the physical part of our project on 8th November 2000. Ian Shaw died yesterday in a care home after a long period of enduring Alzheimer's. He was also one of the few that put substantial funds into our enterprise prior to the share launch not knowing whether it would be successful or the project would fold. Some of might remember him a wielding an electric chain saw in the period when bags of logs were created as part of the EVRA fund raising drive. of potholes in station approach and its adjacent footpath. the staff at Shottle, if we had had any on duty. It was a very pleasant day at the railway with good visitor numbers on all trains. The Pullman Buffett welcomed Martin Beresford and friends for a birthday celebration (photo attached) following a trip down the line. The first Railwayman's course got off to a promising start with a small number of eager volunteers. The LMSCA and the DMU Restoration Team continued work on their respective projects. As all eyes are on the opening of the Olympic Games which I am sure will be a magnificent event although in the world of the Railway we have scheduled a Board Meeting tonight! Our day was dominated by a further Steam Experience Day with one of the participants being a former colleague of JHT and, unbeknown by both parties, JHT turned out to be today's fireman. Together with Mick Thomas and John Evans the day passed with the customary kind comments about the service offered. The was continuing dmu maintenance concluding the exterior washing of our fleet and even the Saloon had a bath. I omitted from yesterday's comments the continued good work at Shottle and the Steam Experience team were able to verify that the track on our operational main line was safe for tomorrow's operations. The Booking Hall and Pullman Buffet Car benefited from the good weather with a steady stream of customers. We were very pleased to provide work experience for Miss Marine Brizion from France and her presence seemed to encourage a number of our younger members to engage with the catering offer today. I am pleased to announce she will be back with us on Tuesday to maximise the sale of les billets. Vive l'entent cordiale! PS I am unwilling to put useless links up but if you are able to look at http://taxi.ba.com/ and put in Wirksworth Station's post code you will see Coldwell Street hosting a jet plane. Equally if you put in your own post code it may be amusing. A day that lifted every spirit as the sun and warm was with us. The Pullman Buffet Car benefited from the weather as the foot fall produced a record Thursday take and the Booking Hall was not without its moments as Leigh took the opportunity to introduce new features to our web site. I commend a look at his magic that keeps our site lively and relevant. Alan attached the Lion and Wheel to my Office wall which will feature in a future picture when the light is in the right quadrant. The VCT continued their good work north of Derby Road 1 bridge with two decent fires achieved. There were lots of dmu movements to wash, fuel and generally prepare for the weekend ahead. 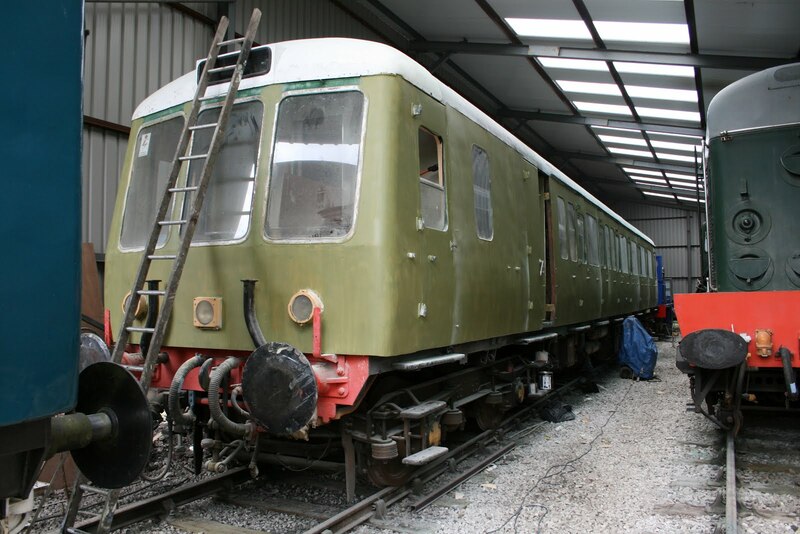 They also managed to transpose the Bubble Car from one Maintenance Facility shed to the other that enabled Dan to commence the application of the first signs of the green undercoat. The LMS Brakevan was extracted from the facility for tomorrow's steam experience day. Credit goes to Richard Preedy who steadily applied weed treatment to the area beyond Cemetery Lane bridge and the Childrens' play area. The miniature railway terminal had its Barlow roof fixed and a picture is attached of our willing neighbour from the Station Garage assisting in this development. We also welcomed a French student studying "hospitality" who will be joining us tomorrow in the Pullman Buffet Car. I am sure anyone on site will give her a most warm welcome. Not quite as warm and lovely as yesterday but the evening is showing promise. The PWT descended on Shottle and continued with the loop project and an engineer descended on Wirksworth to repair a puncture on the Komatsu. Dmu maintenance featured through the day as the 2 Car and 3 Car sets were returned to normal service. Aberdeen Tim started the process of dealing with some unfinished tasks following the reconfiguration of the Pullman Buffet Car with some generous provision of the necessary materials by David N supplemented by those found on site. The Filing Fairy moved ever forward with our personnel records and identifying missing elements of competences and assessments. The Head of Gardening was in evidence on the bank side at Wirksworth. The Booking Hall and Pullman Buffet Car welcomed a number of visitors including a walking group who were homed into our facilities by Norfolk Dave. Who could be downhearted today as the sun was shining and our visitors were very obviously enjoying themselves rather than sheltering from the wind and rain. Our service today started with the 2 Car set, then the 3 Car set then the 1 Car set as gremlins plagued the fleet but our passengers were unaware of these dramas as all our trains ran to time in spite of the curious attentions of a brown cow near Postern Lodge. The booked crew were assisted through the day by Rob and John Evans who ensured all was delivered as promised. A travelling plant waterer in the shape of David N ensured all our displays along the line did not suffer in the warmth and Nathan took advantage of the ideal conditions to paint the exterior of the toilet block as the station buildings at Wirksworth were looking a bit careworn after the effects of the weather throughout this year. Work forged ahead on the Bubble Car and the LMS Brake Third Open which saw end panels placed, roof vents receiving attention and Allison applying paint where she could. 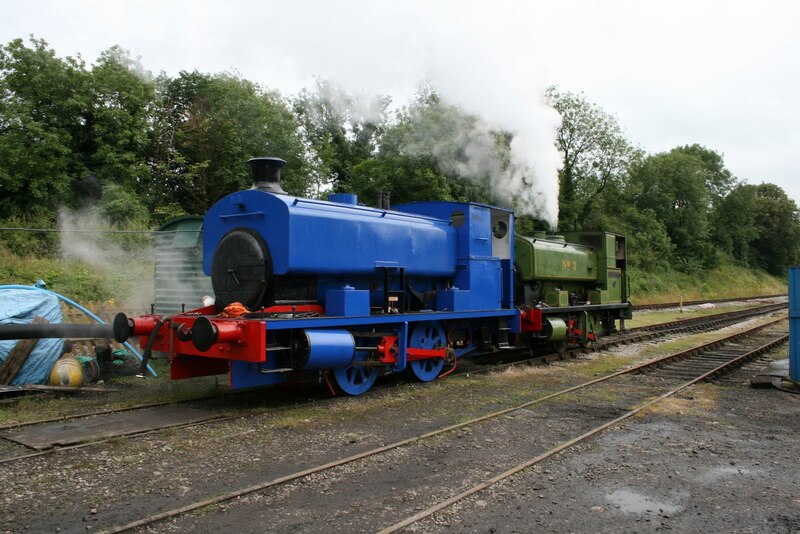 The DST concentrated on Henry Ellison as it can now be reconstructed as a whole locomotive but also managed a service of No3 which is back in action this Friday. 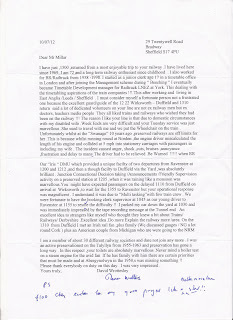 Our service was supported by the Booking Halls at Wirksworth and Duffield, the EVRA shop and the Pullman Buffet Car where tills gently received a satisfactory amount of funds for the day. I must add my thanks to Geoff Clark and his preparation and delivery of a splendid Classic Vehicle weekend together with his support crew over the two days of Leigh and John Stokes. I don't underestimate the background work undertaken by Geoff for this event and the Classic Bus day but they sure help boost our take that allows the enterprise to move forward. The last weekend was the best of 2012 with catering also taking a starring role achieving over 30% of the total take and receiving many plaudits for the standard and style of delivery. Everyone involved can take a bow! Progress Monday 23rd July 2012. Another hot and sunny day lifted our spirits somewhat as we gave our attention to the North loop point at Shottle. Several rails were removed and the kinks taken out with our recently aquired rail bender. The crossing legs were straightened ready for installation, the switches will be stripped and straightened with the whole lot re gauged on Wed and Thurs when we can have possession of the line.We are still a couple of bull head rails short to make the inside curved closure and the downside stock rail but there are a couple of nice lengths of bull head under wash green bridge we can replace with flat bottom rail as we have plenty in stock- a job for anther day. Vct were again in attendance at bridge 24 working their way North into 40 steps cutting - a veritable jungle after all the rain. However a couple of fires saw at least some of it sent back to it's maker. At last we have received the component parts for the water pump for Breeze and research has begun to obtain the parts required to repair it. Trouble is the shaft is missing and unless it can be run to ground then I shall have to make another - a time consuming and difficult task with no drawings or pattern to work to as at least with the old shaft measurements could be taken from it- now I shall have to assemble the pump without the shaft to assess the diameters and lengths using specialist micrometers for the task- fortunately I have a wide selection. The booking hall and buffet saw a steady trickle of visitors basking in the sunshine. Our first day of the Classic Car Rally has been a resounding success. Derbyshire's favourite branch line basked in glorious sunshine as we welcomed visitors from near and a far to our event. The Narrow Gauge and Miniature Railway enjoyed a steady stream of passengers throughout the day and our Wirksworth to Duffield service was very busy too. Number 3 attracted high passenger numbers too as it performed faultlessly on the incline. We welcomed a party from the Welsh Highland Railway and thanks goes to Rob Green for facilitating trips to the yard and engine shed. Feedback from the group was very positive and complimented us on the tidiness of our facilities and the high standards of restoration work. Overall, Wirksworth station and car park was a sea of smiling, happy faces. One of these days which serves as a reminder why volunteering on our railway can be such an enjoyable and rewarding experience. More of the same tomorrow please! Another quite wet day prior to the promised heat wave but not without its positive moments as we resumed our steam experiences after No3's technical absence. Our two participants today were ably entertained by Dave Williams and JHT who covered Idridgehay and the Incline for their benefit. The Class 119 restoration made further progress as did the Bubble Car. The Pullman Buffet Car and Booking Hall benefited from the growing holiday footfall and L J Breeze's water pump was returned, unrepaired, to await internal ministrations from Dales Rail Engineering. Credit to Nathan and Tim who participated in the preparations for the upcoming weekend which we hope will prove a winner in this year's calendar of events. Despite the encouraging remarks from Radio 4 the weather in our micro climate seems to still contain a lot of wetness. However, during the dry periods the PWT have gone as far as they can with the drainage at Idridgehay which will have to be followed up by a muck removal train. This is not as easy as it seems as we have been without a shunting engine since last October when we entrusted L J Breeze's defective water pump to two reputable concerns. At best, the water pump will return to Wirksworth tomorrow, unrepaired, to enter the workshop of Dales Rail Engineering. I am not holding my breath after so many broken promises. The VCT returned to the area north of Derby Road 1 bridge as they deal with the encroaching vegetation in that area. I am not certain about the number of fires but I am sure there will have been some. Alan planted a donated "Beware of Trains" sign at the north end of Platform 2, Wirksworth, and very tasteful it looks. We are not sure of its provenance but he did find some green paint during his restoration. The restoration of the Bubble Car progressed but a further area of rust was discovered requiring further surgery which has set the project back a little. The Filing Fairy bravely came in today whilst not feeling in the best of health but further refined our documentation and systems. 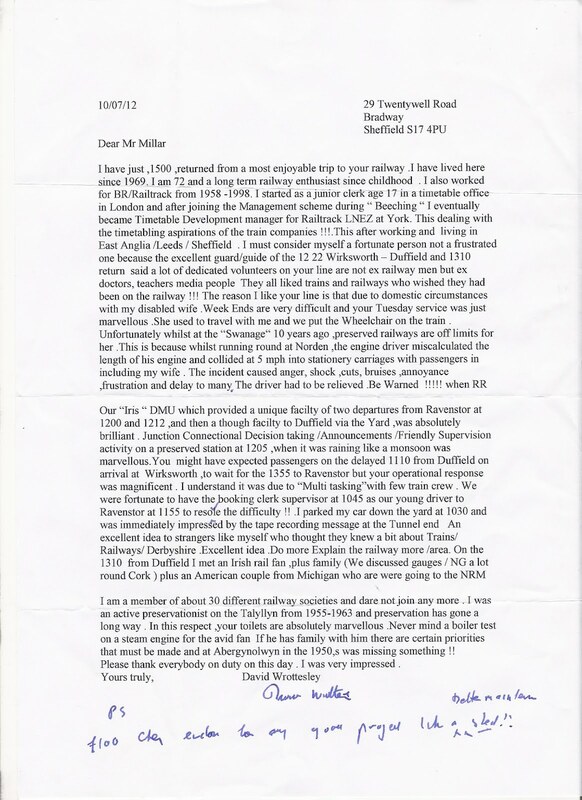 David N provided a power supply to enable the sockets in the First Open to be used from our domestic supply, quite vital for the interior cleanliness of the vehicle and he then moved on to provide a temporary domestic supply into Duffield's Booking Office. We celebrated the young and the old today as Ben and Olli demonstrated their acquired skills in the complexities of splitting diesel multiple unit sets that is a great credit to them and John Gratton who reached the significant age of 77. John's contribution over the last 11 years includes one of the areas that all our volunteers use, together with our visitors, the toilet system. Without him there would be a great deal of discomfort! Anton pursued his regular and so essential work of putting up the road side signs for the approaching weekend and Tony W re-established the stopping points at Gorsey Bank that are designed to mitigate the perceived nuisance of exhaust fumes for our neighbour there. The dmu team prepared their fleet for the weekend. The Booking Hall and Pullman Buffet Car plied their trade to the occasional visitors to site today. A gentle day in the Valley with the PWT taking centre stage as they further attacked the drainage north of Idridgehay which represents another unsung but essential task to keep our trains running - at least the rain held off today. The Lone Carriage Cleaner restored the Royal Saloon to good order for another starring role this coming weekend and ensured that the two car set was presentable. We said another farewell to D8001 as it returned to Boden Engineering at Washwood Heath for further attention and progress was made on the Bubble Car as it nears the end of its extensive restoration. The Pullman Buffet Car and Booking Hall welcomed the passing trade which grows in numbers each week. What a pleasure today has been with the warm sun welcoming our visitors as we have had the best Tuesday since the weekday services started with Duffield getting into its stride for revenue generation. All trading areas had a good day including the Pullman Buffet Car and EVRA shop and this was topped up with our Day with a Driver and his three friends from Ashby de la Zouch who were most complementary about the welcome they had received. 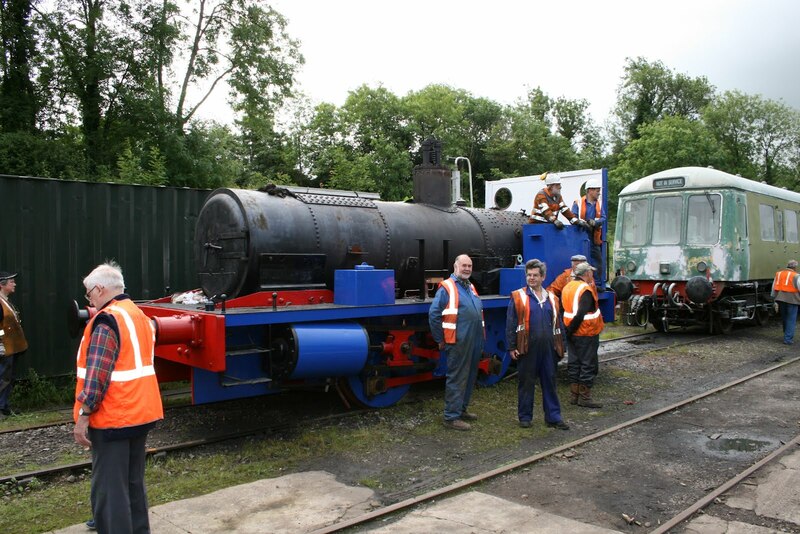 Whilst the money earners were doing their thing the DST bathed in a warm glow, deservedly so, as Henry Ellison's boiler was reunited with its chassis. This process involved a mega shunt that employed No3 and 31414 and achieved a number of worth while repositioning moves. D8001 was moved to the Car Park ready for despatch to Washwood Heath tomorrow, the Bubble Car was moved to the Water Crane Siding to enable work to continue on its restoration and the LMS brakevan was moved undercover for a makeover as our sole "posh" accompaniment to our various driver experiences. Much appreciation to everyone involved who ensured all went well. The LMSCA fitted its recently delivered steel end panels for the Brake Third Open and very fetching they look underneath the tarpaulin. John Allsop fixed a further four Pullman crests to our fleet and very impressive embellishments adding value to this product. Unfortunately I have had very thin offers for naming these vehicles but am open to further financial persuasion. 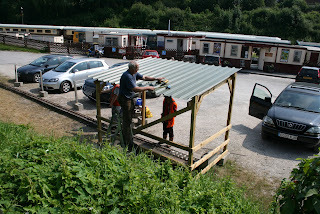 Work continued on the Bubble Car and Fred & Iris gave their Tuesday do to the Mess Hall. The Booking Halls were most active and Wirksworth continued to generate group bookings for the future together with further preparation work for this weekend which looks as though it will be a stunner! Another wet day as p way made a start on the drainage issues around the railway. Work commenced in the cutting just North of Idridgehay level crossing. All 13 manholes were cleaned of silt etc and the pipe runs between rodded out. This revealed 3 places where the pipes are partially blocked due to collapsed pipes, broken pipes or foreign matter - either way digging out the offending areas with the Komatsu and replacing the pipes is the order of the day to cure this problem. Vct made more progress at bridge 24 with 1 fire and very soggy volunteers. Further survey work was carried out to assess the work required South of Jebbs lane Bridge. Steam team were in attendance to cure steam leaks from the main steam pipes on No 3 and we await the result. We also played host to another lad on work experience- Ryan. I wonder what he thinks to a job that involves being wet all day - but hey, if you're gonna live on an island in the middle of the Atlantic then what do expect, sunshine - surely not!! I had to share a letter received this morning with you! It really does make it all worth while. its contents for its new role as a small station workshop. making some amendments to the lighting circuits. seeming simplicity which is in fact requires serious time and effort. will doubtless be much caressed by its many followers. Our day with the driver guests travelled from Milton Keynes to visit us and were most complimentary about the hospitality they received. The 2-car set behaved itself today and Iris received some minor adjustments to its number one engine. The model railway was open and enjoyed a steady stream of visitors. Down at Duffield the station foreman removed an abundance of weeds. A most satisfactory day down at Derbyshire's favourite branch line. It was truly Friday the 13th as we entertained Prof. Felix Schmid and his guests for his 60th birthday celebrations. The plan was, and paid for, the Royal Saloon together with footplate trips on No 3. However, this was not the end product. The Class 33 and the Royal Saloon worked seamlessly with the Schmid party being collected from Duffield and then enjoying lunch on a return journey to Duffield. Meanwhile No3 had failed and its stead taken by Iris which did prove to be a winner. This event, which was quite costly to our client, was rescued by the combined efforts of Graham Walker, Richard Buckby, Tony Watt, John Evans, Patrick Lidgett and Tom Tait. Patrick achieved a smooth transition from Catering Assistant to Iris driver. Will, our work experience person, together with Patrick kept the Pullman Buffet Car open and Angela and Amanda starred on the Saloon. The day was rescued by our train crew who ensured our visitors had a great end to the day. It was good to welcome a number of people from Switzerland and South Korea including a retired Swiss regulator who seemed to be the equivalent of our own HMRI.. The day had unremitting rain and through the efforts of our team all our visitors left with a warm glow following their visit to a very wet Derbyshire. In amongst this dreadful weather Rod and Mary made amazing progress with the packing behind the buffers of our LMS brakevan that had rotted away and our charter team completed their day by fuelling and preparing tomorrow's train sets. I am immensely grateful for all the team turning what could be an immensely embarrassing day into a delightful conclusion. A most pleasant and warm day, our one day summer, saw the PWT complete their task of greasing the fishplates between Wirksworth and Idridgehay. They then went on to do a little ballast fettling at Hazelwood and Shottle before dealing with the flangeways of Idridgehay level crossing which had accumulated material washed down from the main road. All in all, a very good day. The VCT completed their attack of the encroaching vegetation between Ken Rowlands crossing and Derby Road No1 bridge with a three fire day and their next area of activity is towards the 40 steps crossing. Nature continues its efforts to reclaim our line but the team will prevail! There was much shunting to prepare the Wirksworth site for tomorrow's birthday charter that will involve the Royal Saloon, the Class 33 and No3 on the Incline. There was also maintenance of the two car set after it disgraced itself on Tuesday. The Royal Saloon was checked over internally and externally and looks a treat for its next starring role. The Booking Hall and Pullman Buffet Car gently traded with a number of visitors brought out by the unusual sight of the sun. It was very pleasing to welcome Geoff Clark into our fold and become more involved in the Railway after his spectacular success with the recent Classic Bus event and the upcoming Vintage Transport Event which looks as though it will be equally successful. The PWT were the stars of today as they completed the long project of cutting the former long welded section between Idridgehay and Shottle into 240 ft jointed lengths with the last four cuts. This work has been arduous as all the cuts have to be done twice to provide the necessary expansion gaps but the end product enables us to be more relaxed about the prospect of track buckling in hot weather. The team also completed a further 50 pairs of fishplate greasing between Wirksworth and Idridgehay leaving a further 12 pairs to be dealt with tomorrow representing another essential task to allow the 60ft rail sections to expand and contract without distorting the track. It is likely that some of these fishplates have not been removed since the British Rail era which gives us more comfort that our infrastructure is in better condition that is has been for 40 years or so. The LCC tended to Iris, the 2 Car set and the Royal Saloon expressing some concern that other attempts at cleansing these vehicles had not used the appropriate materials. Her comments have been taken on board! Tony W tackled the Incline track vegetation by a mixture of hand pulling the weeds and the application of Roundup. Tim also contributed to the presentation by forging towards Ravenstor with the mower. The Filing Fairy was in go mode as we close in on outstanding competence evidence on peoples personal files with great effect. The Filing Fairy's husband checked the line between Idridgehay and Shottle against the results from his Track Recording Trolley revealing no areas of particular concern. Again most valuable work for the safe operation of our trains. Within the Booking Hall, Shottle featured with a booking from a walking group and a second enquiry as to whether the station would be open this weekend. All most encouraging. The Pullman Buffet Car entertained a few visitors and completed a cake for a birthday charter on Friday. Will, on work experience this week from the Queen Elizabeth Grammar School, Ashbourne contributed to today's catering operation and has been most taken by his welcome by all departments. The Bubble Car progress and Rodney has revealed the station sign at the top of the station approach at Duffield that had become obscured by vegetation. The day was marked as being without rain! As ever the weather featured with a better than forecast day at Wirksworth existing in its own micro climate but Duffield suffered as compensation. We had quite an exciting day as the two car set misbehaved on the Duffield service resulting in Iris shuttling between both the Ravenstor runs and our "main line" services. This was fairly seamless for our passengers and a little bit of entertainment as Iris shuttled backwards and forwards. The Pullman Buffet Car and the two Booking Halls doing their bit although those people originating at Duffield show we have a lot more to do to evidence this station as our main entry point. The EVRA shop had a pleasing day with stock moving in and out between the showers. The DST had a very significant triumph with the boiler inspector signing off Henry Ellison's boiler as fit for purpose and the successful conclusion of repairs to No3. Tim gave the Pullman set a thorough exterior wash as the very wet weather continues to disfigure this trio of vehicles with unseemly streaks. Tim's efforts are much appreciated as presentation is all! There was a further visit to Shottle to improve its temporary access arrangements and our horticulture at Wirksworth received routine maintenance. The "Jim Crow" rail bending apparatus received its final attention before being let loose next week. The LMSCA were pleased to complete the pillar replacement at the north end of the Brake Third Open and have presented Twiggs of Matlock with the templates for new steelwork for this end of the vehicle. Some encouraging news of their insurance claim on the disastrous fire in the Third Open would seem to chart a way forward for this vehicle. I must say that the prospect of a delightful two car Stanier set is very heart warming. The Bubble Car moves ever forward as illustrated in the attached photo and will be a welcome return vehicle to our fleet. Iris demonstrated today that our weekday service can be delivered by single unit vehicles very economically if there are no pre booked parties. I used to broadcast to the UK in a former life and particularly enjoyed the cut and thrust with Brian Redhead, another voice from the past. (Not many names to drop these days) How times move on I as I am interviewed by Ashbourne Radio. Nonetheless, I hope we will have an Ashbourne rush for our seven day opening of the Pullman Buffet Car. These bolts cost nearly £3 each and what would we do without aircon in Derby technical center. We also welcomed a new recruit today on work experience - a pleasant lad called Will who won't, no doubt, due to his excellent attitude find any problem gaining employment when the time comes. VCT continued with their work at bridge 11 with 2 big fires ( quality not quantity ) allowing more daylight onto the railway. Other than that a quite day Wirksworth. Duffield and back, followed by several cases of wine in the Pullman. returning the mower by train to Wirksworth, where it is required on Tuesday. contained so many lousy hairdressers. I am happy to report that the weather forecast was wrong for today and our railway was blessed with glorious sunshine for most of the day which had a positive impact upon visitor numbers. At Wirksworth we welcomed a group of visitors from the Skipton Railway Society together with heritage railway enthusiasts from the Embsay Railway and Ayrshire Railway Preservation Group. A special mention must go to Eunice and Ken from the Ribble Steam Railway who run the railway's cafeteria. They happily stepped in to help our catering team cope with the hungry hordes descending on the Pullman Buffett. Down the yard the DST made excellent progress and have successfully re-fitted both No 3's steam pipes. A revitalised DMU Team continued their interior restoration of the class 119 interior whilst the fitters commenced work on its engines. The saloon also received attention in preparation for Friday's special event. The LMSCA continued making pattens for BTO 27001 and the PDLG worked on the heat exchanger of 33035. A glance at the TV shows Wimbledon bathed in sun but Wirksworth and the remainder of our Railway was bathed in water. We had a line examination with Iris that showed many areas where the drainage could not cope with the deluge and lineside vegetation weighed down with the rain. Nonetheless, there seems to be a slight relief this evening when we hope the waters will subside. The line examination did pick up a couple of casual travellers and we welcomed a small group from the London County Council Tramways Trust who are launching their latest restoration at the National Tramway Museum this weekend. Unfortunately this is an open topped car which will prove to be quite an adventure for their guests. Down in the Maintenance Facility the Bubble Car has acquired its first pass of green undercoat on one side. The Booking Hall and Pullman Buffet Car entertained more hardy souls and we learned that Amanda, one of our new catering team, is a coded welder! You just never know what talents surround us. Another most productive day with the PWT achieving a further 4 cuts in the former long welded section leaving a further 4 when temperatures are right for the task. Haven been beaten by the day warming up the team went on to grease a further 12 pairs of fishplates and equally dealt with the expansion joint at the Idridgehay end of the late long welded section. The VCT had a three fire day in the area of the Sewage Works and managed to break their transport which will engage the Wirksworth Station Garage tomorrow. The Filing Fairy pursued her relentless task of bringing our paperwork bang up to date and dmu maintenance included a service on the two car set. There was a most pleasing footfall through the Booking Hall resulting in much catering activity with the Booking Hall itself concentrating on the approaching Classic Transport Weekend. With great joy and relief the threatened heavy rain did not materialise and we had a most civilised, warm, day in mid-Derbyshire. More rain today that had a positive effect on rail temperatures allowing a further 8 joints to be created in the former long welded section by the PWT in the most unpleasant of conditions. The PWT also patrolled the Incline and collected a further one hundred brand new fishplate bolts from Doncaster. A great credit on all concerned. Opportunity was also taken to check and service the level crossing lights at Gorsey Bank and Idridgehay. I have a technical correction to make in that both steam pipes within the smokebox of No3 were found to be defective but those within Henry Ellison seem to be OK. The DST are pulling out all the stops to return No3 to service early next week although I have had to disappoint a further three customers for the planned experience this Friday. The LCC cleansed Iris and the Training Room and the Bubble Car received further filler and undercoat. The Booking Hall and Pullman Buffet Car received a number of soggy visitors and you have to feel sorry for anyone holidaying in the area or, perhaps, anywhere in the UK. It may be July elsewhere in the World but in the Ecclesbourne Valley it is very like January. Wet, miserable and cold as our passengers for the day were made welcome and enjoyed the warmth of the train, our staff and Pullman Buffet Car. It is quite a miracle that we had a good financial day although the Duffield sales were quite disappointing as, I suspect, that through ticketing is disappearing of the radar. The DST had a difficult day as they tried very hard to remedy No3's steam pipe defects and, very annoyingly, found a similar problem with Henry Ellison's smoke box steam pipe. The end result is the unfortunate cancellation of a second steam experience day which I will advise to the expectant customers tomorrow. The LMSCA make considerable progress with the north end of the Brake Third Open including the manufacture of patterns for new steelwork required. The PWT patrolled between Duffield and Shottle and the Watt Fishplate Bolt Company refurbished a further 16 of the little beasties. Fred and Iris gave the Mess Hall a good do and Matthew removed the flooring on Cathryn. The Booking Halls, EVRA Shop and Model Railway were open for business and the Pullman Buffet Car served some 16 lunches to a prebooked party and had a good footfall as people sheltered out of the rain. 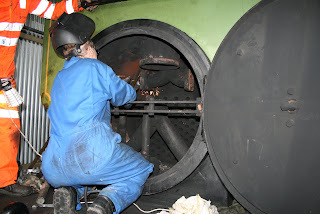 I attach a photo of the interior of No3's smoke box that illustrated the difficult conditions the repair team were working in featuring Paul. I would like to add my congratulations to everyone involved in the classic bus Sunday. Geoff Clark's organisation and preparation over several months produced another winner for us and he deserves our sincere thanks. Many of our team helped the event work smoothly attracting a large number of pleasant comments from our customers and they equally deserve our thanks. May I single out the Catering Team that included Fred & Iris who achieved the best ever take in our 11 years of activity. Fred is now a qualified burger turner and Jake has willingly taken to the world of fine dining. Nearly forgot a line inspection from Wirksworth to Idridgehay was also carried out- in the rain of course - by lone patrolman Tony Watt. A more miserable Monday of late thanks to British weather plc.A leaflet dropped through my letterbox the other day extolling the virtues of holidays in Britain - are these people for real. Anyway P way trundled off to Idridgehay and commenced further cutting of the cwr with 6 joints completed today despite the rain. Difficulty was experienced cutting the rail as even with the rail temp as low as 15 degrees the rail was under compressive stress. It shows just how far out of spec this section of cwr has become and a stitch in time cutting some expansion gaps into it before we have a track buckle - mind you with our wonderful weather there's not much chance of that. Vct continued work at br 24 with 2 fires and Mike Billings continuing to flail down offending tree branches that are foul of the line. Another group of men who, like p way, work in the horrible weather without complaint to further our cause. Steam team member JHT spent his day taking a cracked main steam pipe to Israel Newton for repair and arrived back late in the day with said pipe duly fixed allowing steam experiences to go ahead on Friday. which had very nearly chugged its last at the bottom of Coldwell Street.